Our newest Paulist priest, having been ordained just yesterday, celebrated his First Mass this morning at St. Paul the Apostle Church. It's always a joy to be back in our community's "Mother Church," to return to the altar where I celebrated and concelebrated so many Masses during my 10 years as associate pastor, but especially to be back for such a joyful occasion as we celebrated there this morning. Particularly to the point on this 6th Sunday of Easter, it seemed to me, was the first reading at Mass. It recounted the famous story of Philip’s evangelizing mission in Samaria and the response this produced from the Mother Church in Jerusalem (Acts 8:5-8, 14-17). Yet none of that seems to have deterred Philip, who proclaimed the Christ to them. Nor did it prevent those Samaritans from paying attention to what was said by Philip. The result was great joy in that city and yet another leap on the Church’s part, another experience of expansion, growth, and diversity - in keeping with the whole trajectory of the story of the early church in the Acts of the Apostles which, can be summarized as: Good News travels far to build the Church and heal the world. Even so, there inevitably were some serious questions raised back in Jerusalem about what Philip was doing. So Peter and John went to see for themselves what was happening and to interpret what it meant. Surrounded by Samaritans, whom they would have probably tried to avoid until recently, Peter and John laid their hands on them and they received the Holy Spirit. There is only one Holy Spirit. If the Samaritans were going to become believers, they had to be united with the Church led by the apostles. The apostles may well have been surprised initially, both by Philip’s initiative and by the Samaritans’ ready response. Surprised or not, they saw in what was happening the direction they were intended to go. Acts constantly presents the Church as learning from her experiences, confident that, thanks to the Risen Christ’s continued presence in the Church through his Holy Spirit, what happens in the world really is significant. Faith does not eradicate the differences that exist among peoples, but it does create a new relationship for all of us with God and with one another - in Christ through the Holy Spirit. Peter, John, and Philip all learned this from their actual experience of how God was acting among different peoples. Likewise, faith alone does not resolve all the problems we will experience in our life together as Christ’s Church. It does, however, give us confidence in the Risen Lord’s presence among us in the structures of his Church - in the successor of the apostles in union with the successor of Peter - and in the power of the word of God, which continues to be proclaimed in the Church, to create a unity which transcends our human divisions and limitations. What a wonderful message any Sunday, but especially on this Sunday when the Holy Father himself is on pilgrimage in the perennially conflicted and divided Holy Land! And what an apt message for us Paulists on this Sunday when we are especially celebrating our priestly ministry and life together with the First Mass of a newly ordained priest! 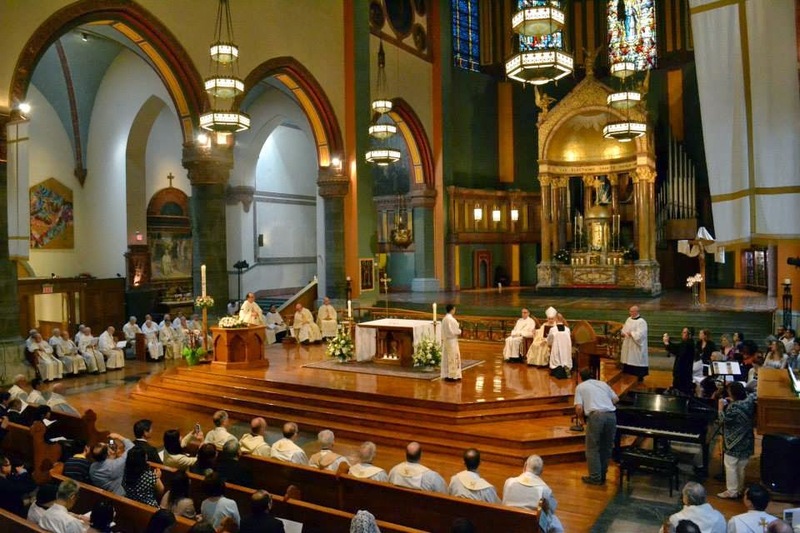 Friday afternoon at the Paulist Motherhouse in New York City, the 2014 Paulist General Assembly was called to order by the outgoing President. After the formal preliminaries of seating the delegates and ascertaining the presence of a quorum to do business, the outgoing President gave his final Presidential Report to the community and then handed the gavel over to the new President. Later that day, a beautiful Installation installation in the Paulist Mother Church was celebrated, at which we concelebrating Paulists all renewed our promises and the new President was invested with Servant of God Isaac Hecker’s Mission Cross. The fact that our new President is himself a New Yorker (albeit originally from Dutchess County) and is still fondly remembered at St. Paul's from his first priestly assignment there gave the event an added dimension of local festivity. We began by singing Shall We Gather at the River, evoking the the special significance of the Hudson River in the new President's own life and in the history of our foundational Paulist parish. And later in the same Mass we sang In the Breaking of the Bread, an Easter hymn very dear to me from my own decade as associate pastor at that parish. Following the Mass, a marvelous reception was held in auditorium organized by the parish staff, followed by a Paulist dinner at which we honored our Golden and Silver Jubilarians and the new President officially announced the new community assignments. I can now confirm that I will be continuing as Pastor at Immaculate Conception Church in Knoxville and will also become the Superior of the local Paulist community. Today was another happy day as we celebrated the ordination of our brother Jimmy Hsu to the priesthood. As MC for the ceremony, I was necessarily preoccupied with many ritual and ceremonial details that such a celebration entails, but never too preoccupied to be moved as I always am by the grace of the priesthood and the special bond of religious community life. Tomorrow, Father Jimmy will celebrate his First Solemn Mass at the Mother Church. Then it is Amtrak to Washington, DC, for the continuation of the Assembly. This is my first time ever as a delegate to such an event, and I look forward to being part of the process of responding as a religious community to the challenges of the New Evangelization to which the Church is being called in this dramatic era. Today was Graduation Day at our regional Catholic School. I celebrated Mass this morning for the graduates and their families, as well as for the other grades who will be returning next year. At the actual Commencement Exercises this evening, I was privileged to present the annual Servant of God Isaac Hecker Prize, which is awarded to the graduating 8th grader who writes the best essay on how being a faithful Catholic can contribute to making a person a better citizen and the United States a better country. My own 8th-grade graduation occurred almost 53 years ago - on June 25, 1961. That was another world in so many ways, but in essence the experience of graduation remains much the same. One set of experiences and relationships comes to an end, and newer and more varied future experiences and relationships are promised. Hopefully, one can build on the knowledge one has acquired, the friendships one has formed, and the experiences one has had to prepare oneself for the next set of challenges. But, however much looking backward may seem to be the essence of any graduation, it is what lies ahead that matters. After all, however formative my grade-school years may have been (and they were in significant respects), almost all of my life has passed since that long-ago graduation. I used the Votive Mass of Thanksgiving this morning. That's an obviously appropriate choice for graduation day, although if there were a specific Votive Mass for getting ready to face new and a yet undefined challenges, I think that might be at least as appropriate, maybe more so! Today's 1st reading at Mass (Acts 15:7-21) recalls the Council of Jerusalem. In the context of graduation day, one of the things I find most striking - and inspiring - about the Council of Jerusalem story is how, despite the unprecedented challenge they were facing, the leaders of the apostolic Church had confidence in the Risen Lord's continued presence in the Church and hence had confidence in their ability as a community to resolve the complex issue they faced. My hope for this year's graduates is that the experiences and relationships they have had thus far (and will hopefully be able to build upon in the coming years) will help them likewise continually throughout their lives to recognize the presence and action of the Risen Lord in our life together as his Church and thus also feel confidence like that of the apostles in Acts. Contemporary commencement speeches seldom get the attention such speeches often got in the not-so-distant past. If they do get any attention today it is actually more likely because of some controversy about the choice of speaker - such events having become yet one more occasion for personal outrage and political posturing among competing elites. The notion that great universities provide a setting for the public articulation of major policy initiatives seems largely to have gone the way of the even older notion of universities as a setting for great ideas. Fifty years ago, however, statesmen still spoke serious words when invited to universities, and people in the wider world beyond academia actually cared. Thus it was when, 50 years ago tomorrow, on May 22, 1964, President Lyndon Johnson addressed an audience of some 90,000 at the University of Michigan at Ann Arbor. Johnson had already used the phrase "great society" on other occasions, but that day he elaborated on the idea which would be the animating ideal of his presidency. It would be a full-force, all-out effort not just to remediate this or that isolated economic injustice but to short-circuit the vicious cycle of poverty and provide society with a more just, equitable, and fulfilling framework. "The Great Society," Johnson declared, "serves not only the needs of the body and the demands of commerce but the desire for beauty and the hunger for community. ... It is a place where men are more concerned with the quality of their goals than the quantity of their goods." Of course, like all such progressive ideals of the time, the "Great Society" presupposed abundance as a prerequisite. But presuming that, the greatness of Johnson's ideal lay precisely in aiming beyond merely the material redistribution abundance makes possible. Johnson's "Great Society" was "a challenge constantly renewed, beckoning us toward a destiny where the meaning of our lives matches the marvelous products of our labor." Imagine that! Our society and it so communal fabric have so deteriorated since then that such aspirations seem almost beyond even imagining. It says a lot about the early 1960s (before everything started to fall apart) that we could actually entertain such aspirations! In the old calendar, today was the feast of Saint Peter Celestine (c. 1215-1296). Pietro da Morrone was a Benedictine solitary, who founded a branch of the Benedictines subsequently known as the Celestines. In 1294, the College of Cardinals ended a prolonged vacancy of the Holy See by electing the pious hermit pope by "inspiration." He became Pope Celestine V. As the pre-1969 Roman Breviary told the story, "he was elected to the Chair of Peter without his knowledge and in his absence. The news of his election filled everyone with as great amazement,a s it did with sudden joy. But when he had been elevated to the papacy, distracted with various troubles, he saw that it was almost impossible to attend to his accustomed meditations, and resigned the burden, as well as the honor, of his own free will." His surprising reign and even more surprising resignation in December 1294 - after only 5 months on the papal throne - were followed by the election of the infamous Boniface VIII, who soon had the ex-pope arrested and imprisoned at Fumone in Campagna. He died in there on May 19, 1296. Canonized in 1313, he is still venerated in his native Abruzzi region, where he is buried at L'Aquila, the site damaged by a severe earthquake in 2009. 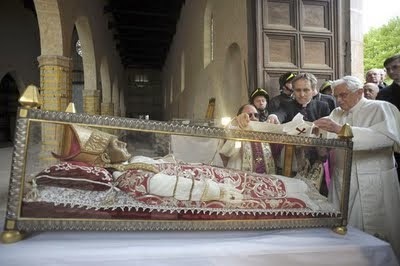 It was while visiting that site afterwards that Pope Benedict XVI placed his original papal pallium on Pope Saint Celestine's tomb (photo). 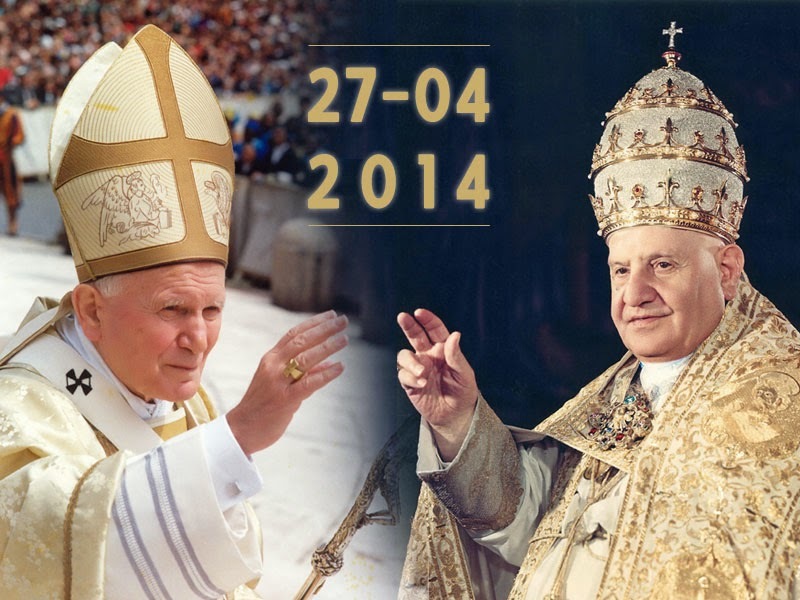 In 2013, Pope Benedict became the first pope since Celestine V to resign the papal office. Thankfully, he has been able to enjoy a more peaceful and dignified retirement than Celestine was afforded! In his Inferno (III, 59-60), Dante placed one, "who by his cowardice made the great refusal." This unnamed figure has been widely (although not unanimously) thought to be Pope Celestine, whose abdication Dante blamed for making possible the reign of Boniface VIII, whose assertion of papal political supremacy Dante disputed in his De Monarchia. Boniface himself was still alive when Dante wrote his Divina Comedia, but Dante put him in hell anyway. Pope Celestine's story served for a long time as a negative precedent against the desirability of future papal resignations. Pope Benedict and his successor, Pope Francis, have now created a new, much more positive precedent, which may historically serve the Church better than the sad story of Celestine and Boniface. Some 20+ years ago, sometime during my 9-year diaconate, a priest at whose Masses I regularly assisted as deacon once questioned me to check whether I really recited the silent prayer prescribed to be said while adding a little water to the wine in the chalice at the Preparation of the Gifts. (An abridgment of the ancient and venerable offertory prayer, Deus, qui humane substantiae ..., that used to be said by the celebrant as he blessed the water and then poured it into the wine, the prayer's contemporary English words were, By the mystery of this water and wine may we come to share in the divinity of Christ, who humbled himself to share in our humanity.) At the time, I assured the priest that I did indeed recite it faithfully as prescribed, but added that if he had any doubts or worries on that score he should say the prayer himself, just to be safe! Knowing his personality, I interpreted his concern as an excess of caution, what some might call scrupulosity. But it could also have been interpreted as an illustration of a certain residual lack of confidence in the deacon! That incident came to mind today as I listened to the 1st Reading at Mass (Acts 6:1-7) which recounts the familiar story of the Apostles' appointment of the "Seven." The deacons were scheduled to preach at the parish Masses today, and I somewhat expected them to use the occasion as an opportunity to say something about the diaconate. To my surprise, neither chose to do so. Of course, the "Seven" were not specifically called deacons in the story, and it is debated how explicitly Luke had the diaconate in mind when recounting this incident. It is, however, traditionally associated with that order, is sometimes read at deacon ordinations, and is referred to in the ordination rite. In any case, today is a good occasion to note the presence and importance of deacons in the contemporary Church. Growing up, I don't think I'd ever met a deacon. There were, of course, deacons in seminaries, but how many people ever saw the inside of a seminary? In those days, "deacon" designated one of the two subordinate ministers at Solemn Mass. If some special occasion warranted my attendance at a Solemn Mass, I might be asked afterwards who the priest, deacon, and subdeacon were. But they were, of course, all priests (two of whom were dressed as and functioned as deacon and subdeacon respectively). Indeed, a Solemn Mass was often referred to in popular parlance as a "Mass with 3 Priests." Vatican II restored the diaconate as a living order in the Church. And the Church has been enriched by the dedicated and generous ministry of men - many of them older with professional careers, most of them married - who have embraced the opportunity and challenge of service to the Church as deacon, not just filling in for a diminished number of priests but exercising a specific ministry genuinely distinct and complementary to that of bishops and priests. I'm sure when the permanent diaconate was restored that there were doubts and uncertainties about how this would work out. The final chapter in the evolution of the permanent diaconate may remain yet to be written, but the current experience of the restored diaconate has more than vindicated the Council's courageous decision. It seems almost everyone is talking about Harvard University's "black mass." Well, that's certainly an exaggeration. Most people, most of the time, probably pay no attention at all to Harvard and its activities. But, for those who do, the proposed reenactment of a "black mass" planned by a Harvard Extension School student group has certainly garnered lots of attention. The idea of a "black mass," as it has been transmitted in literature and legend over the centuries, is a ritual parody of the central sacramental ritual of the Catholic Church. Parodies only make sense, of course, in a cultural context where what is being mocked is widely recognized as sacred. The "black mass" has its origins not in some supposedly modern secular society, but in a sacral world, where the only plausible alternative to divine worship would be demonic worship. Negotiating the relationship between truth (which ironically is Harvard's motto, veritas) and freedom has always been something of a challenge. Prioritizing truth necessarily makes freedom instrumental at best. Prioritizing freedom inevitably relativizes the value of truth. As a result of our history and for some obvious and serious reasons, contemporary western societies have for the most part prioritized freedom. The manifest benefit of a free society is that the pursuit of truth - in religion, philosophy, science, etc. - is protected from coercion, even if only as one competing opinion among many in the resulting culture of relativism. Thus, in his statement on the "black mass," Harvard's President cites Justice Holmes argument that freedom of expression "protects not only free thought for those who agree with us but freedom for the thought that we hate." Truth is not the only value relativized by freedom of expression, of course. While post-modern secular societies have become increasingly uncomfortable with truth claims, a more contemporary form of absolute claim is that of "inclusion." Recognizing the evident evil in the proposed satanic ritual, Harvard's President properly condemns it - invoking the value of "inclusion," the cultural language presumably most acceptable to a contemporary audience. That said, her condemnation seems clear and unambiguous: "The decision by a student club to sponsor an enactment of this ritual is abhorrent; it represents a fundamental affront to the values of inclusion, belonging and mutual respect that must define our community. It is deeply regrettable that the organizers of this event, well aware of the offense they are causing so many others, have chosen to proceed with a form of expression that is so flagrantly disrespectful and inflammatory." In a truly free society, "disrespectful and inflammatory" speech and expression have to be lived with as part of the price of the freedom which we value for the personal and social goods freedom makes possible. But freedom from coercion does not equal or mandate passive approval. Indeed, such "disrespectful and inflammatory" speech and expression can and should be responded to - and in a way which recognizes both the responsibility that goes with living in a free society and the fundamental human responsibility to use freedom to promote a good society. I think the Harvard President's statement captured that complex commitment in her conclusion: "I plan to attend a Eucharistic Holy Hour and Benediction at St. Paul's Church on our campus on Monday evening in order to join others in reaffirming our respect for the Catholic faith at Harvard and to demonstrate that the most powerful response to offensive speech is not censorship, but reasoned discourse and robust dissent." Meanwhile, how many times in his little more than one year as Pope has Pope Francis warned us about Satan’s persistence? “Look out because the devil is present! The devil is here,” the Holy Father reminded us again in one of his recent Lenten morning homilies. As any teacher knows, to repeat the same news over and over again can help it to be accepted, to be learned, and even to become one of the things that matter most in one’s thinking. Likewise, for us to hear the proclamation of the resurrection, over and over again during these Easter Sundays, strengthens our faith by the witness of others’ faith - in particular the faith of the apostles. So one of the most noticeable features that distinguishes Easter from the other seasons of our Catholic calendar is the daily reading from the Acts of the Apostles. Through our annual journey with the apostles though the history of the early Church, we identify ourselves with that first generation of Christians in their exciting experience of the Risen Christ. We do that in order to become like them – to become a community of disciples which witnesses to the presence and action of the Risen Lord in his Church, a community which expresses its new life in its liturgy, from which it then reaches out into the wider world. In his Message for today’s 51st Annual World Day of Prayer for Vocations, Pope Francis writes of our participation “in a communal journey that is able to release the best energies” in and around us. Now, one possible response to Peter’s message might be a certain feeling of remorse. In the process of conversion, guilt is often a first step. Remorse alone, however, can get stuck in a focus on oneself. We avoid getting stuck, we avoid being absorbed in ourselves, when guilt goes forward to true conversion, which resolves guilt with forgiveness and the freedom which comes from forgiveness. The proclamation of the good news – whether in 1st-century Jerusalem or 21st century Tennessee - ought always to lead us to that experience of conversion. As Peter told the people, the promise is made to all those. Whomever the Lord our God will call. The apostles’ message of the call to conversion was, in that first instance of course, an invitation to identify with Christ in baptism. But, once we have been baptized, we are also repeatedly invited, as Peter exhorted his hearers in today’s 2nd reading [1 Peter 2:20b-25], to follow in Christ’s footsteps, living the new life made accessible to us by Christ’s death and resurrection, remaining united with him no matter what. We hear this message repeatedly during this Easter season, Sunday after Sunday, inviting us to see something that wasn’t just for the 1st century, but is addressed to us here and now in our own 21st century. In particular, on this 51st Annual World Day of Prayer for Vocations, the Church challenges us to focus in a special way on what is required for the message to continue to get out, to continue to be heard, to get transmitted from this generation to the next, in the life of Christ’s Body, the Church. With confidence in the Risen Lord’s promise to be with his Church forever and never to abandon it, we must - like those first Christians - nevertheless take seriously our own responsibility to do our part in making the mission of the Church actually happen among the people of our day. What does it mean for us to think of our life together as Church as "a well cultivated field of mutual love"? What message might that send out to the world? Homily for the 4th Sunday of Easter (51st Annual World Day of Prayer for Vocations), Immaculate Conception Church, Knoxville, TN, May 11, 2014. Yesterday, Pope Francis received in audience the Secretary-General of the U.N. and the officers of the United Nations System Chief Executives Board. International agencies and organizations often meet in Rome. When they do, a papal audience is often included on their agenda. Papal comments and those of the visiting group on such occasions are often courteous and general. Yesterday's papal address, however, was more interesting than usual. After the usual generalities affirming the efforts of the various agencies represented, the Holy Father got more specific: an important part of humanity does not share in the benefits of progress and is in fact relegated to the status of second-class citizens. Future Sustainable Development Goals must therefore be formulated and carried out with generosity and courage, so that they can have a real impact on the structural causes of poverty and hunger, attain more substantial results in protecting the environment, ensure dignified and productive labor for all, and provide appropriate protection for the family, which is an essential element in sustainable human and social development. Specifically, this involves challenging all forms of injustice and resisting the “economy of exclusion”, the “throwaway culture” and the “culture of death” which nowadays sadly risk becoming passively accepted. Echoing Evangelii Gaudium, the Pope's Post-Synodal Exhortation, this was obviously meant as an actual challenge to international agencies and organizations - and the constituencies they represent. It is a challenge to recognize and actually address some of the serious structural problems that characterize contemporary political and economic life, identified by the labels "economy of exclusion," "throwaway culture," and "culture of death." But the Holy Father did not stop there. We usually tend to address issues of social and economic justice under the general rubric of natural law. We do so for good reason. Policy proposals generally have to resonate with universally accessible moral principles if they are to have any hope of ever being implemented in a pluralistic society. But the Pope's voice can never be that of just another international bureaucrat. Whether speaking ad intra or ad extra, whether within the Church or out to the world, he is always the Vicar of Christ proclaiming the good news - "the joy of the Gospel." And what better way to do that than by retelling a Gospel story? In this case, it was the familiar story of Zacchaeus the rich tax collector (Luke 19:1-10) which the Pope chose to recall. Zacchaeus, Pope Francis reminded his audience of international bureaucrats, made a radical decision of sharing and justice, because his conscience had been awakened by the gaze of Jesus. This same spirit should be at the beginning and end of all political and economic activity. The gaze, often silent, of that part of the human family which is cast off, left behind, ought to awaken the conscience of political and economic agents and lead them to generous and courageous decisions with immediate results, like the decision of Zacchaeus. Does this spirit of solidarity and sharing guide all our thoughts and actions, I ask myself? Without waiting for an answer to his rhetorical question, Pope Francis filled in further some of the specifics of what "this spirit of solidarity" requires of us: Today, in concrete terms, an awareness of the dignity of each of our brothers and sisters whose life is sacred and inviolable from conception to natural death must lead us to share with complete freedom the goods which God’s providence has placed in our hands, material goods but also intellectual and spiritual ones, and to give back generously and lavishly whatever we may have earlier unjustly refused to others. The approach adopted by the media since this Pope's election has been to try to present him as in some fundamental way different from his predecessors. Countering the media's persistent preference for such a hermeneutic of discontinuity, Pope Francis began his talk by invoking his two recently canonized predecessors, Saints John XXIII and John Paul II, and their passionate concern for integral human development. He ended by invoking the encyclicals of his two immediate predecessors, John Paul II (Sollicitudo Rei Socialis 42-43, Centesimus Annus 43) and Benedict XVI (Caritas in Veritate 6, 24-40), stating that equitable economic and social progress can only be attained by joining scientific and technical abilities with an unfailing commitment to solidarity accompanied by a generous and disinterested spirit of gratuitousness at every level. There are so many amazing things happening in this story (as in Acts as a whole) that merit attention. Speaking at Mass at school this morning, I concentrated on the brief bit of dialogue in the story between Paul, blinded by the flashing light and thrown down on the ground, and the heavenly voice. That voice initiated the dialogue by asking, Saul, Saul, why are you persecuting me? This initial question, repeated in all three accounts of the story, elicits from Paul not a reply so much as another question, Who are you, sir? To that he then receives the definitive response, I am Jesus, whom you are persecuting. Jesus then goes on to instruct him what to do, transforming the zealous Pharisee into an equally zealous Christian missionary. Meanwhile, Jesus' self-description, his identification of himself with the Christian community, would provide an interpretive key for Paul's fully developed Christocentric ecclesiology: Now you are Christ's body, and individually parts of it (1 Corinthians 12:27). Paul's "Body of Christ" language speaks eloquently of the unity that is supposed to characterize the Church. But it is always more than just a spiritual version of the once popular political image of a "Body Politic." For the heart of the image is not our union with one another within the body, real and important thought that is, but our union and identification with Christ, from whom our union with one another is derivative. Like the account of Paul's "conversion" itself, the initiative comes from Christ, who first unites and identifies himself with us in the incarnation and then facilitates our response of union and identification with him through his death and resurrection. That response sums up our life with Christ and one another as his Church: living the truth in love, we should grow in every way into him who is the head, Christ, from whom the whole body, joined and held together by every supporting ligament, with the proper functioning of each part, brings about the body's growth and builds itself up in love (Ephesians 4:15-16). More Callenges for Hispanic Ministry in the U.S. The article is based on the latest poll by the Pew Research Center, which "finds that 55 percent of Hispanics in the United States identified themselves as Catholic in 2013, down from 67 percent in 2010. About 22 percent of Hispanics identify as Protestant - including 16 percent who say they are evangelical or born-again - and 18 percent say they are unaffiliated." Two things about this study stand out - or rather jump out! The first, as noted by a senior researcher at Pew, is the surprising size of the decline in so short a period - from 67% in 2010 to only 55% just three years later. It could, of course, be an anomaly. But relying on statistical anomalies does not a satisfactory pastoral strategy make. And God help us all if this is the trend! The second thing that stands out from this study is how "Hispanics in the United States are leaving religion as they assimilate to a more broadly secular culture." The defection of a significant portion of Hispanic Catholics to various Evangelical and Pentecostal churches and movements has long been noted - and not just in the U.S. but even more troublingly in Latin American itself. As for the pattern here, all one has to do is stroll around a Latino neighborhood in a large American city and count up all the storefront churches, as well as the more mainstream churches which advertise services in Spanish. Of course, the fact that a problem has long been noted does not mean it has been adequately responded it. Obviously, it has not. But perhaps even more problematic is the increasing evidence that a notable number of younger Hispanic Catholics are, as Paulson puts it, assimilating "to a more broadly secular culture by becoming religiously unaffiliated, becoming part of the growing group religious researchers label "the nones." Now just yesterday, I commented in this space about a recent Boston College study that focused on parishes which have Hispanic ministry. There was much that was very positive in that report, which highlights the vitality and vibrancy of such parishes, and which Paulson summarizes as "showing that American Hispanic Catholics have higher participation rates in sacramental activities ...but lower participation rates in other aspects of parish life than do other American Catholics." One of those areas of lower participation, which strikes me as particularly problematic, is in relation to Catholic schools. This particular factor - and the diminished participation of American Catholics overall in Catholic schools - is I suspect not unrelated to this larger issue of so many younger Catholics (both Hispanic and non-Hispanic) becoming unaffiliated. As I noted yesterday, the Boston College study points out that 93% of under-18 Hispanics are American born. Hence the study's consequential conclusion: "Much of the Catholic experience in the country during the next few decades will be significantly shaped by how the Church reaches out to this last group and whether young Hispanic in this age bracket, at least those growing up in Catholic households, decide to self-identify as Catholic." The Pew poll simply confirms that there is much more to be done to meet the distinctive pastoral needs of younger, American-born, English-speaking Hispanic populations, who experience some of the same challenges to faith that their non-Hispanic peers are also experiencing. Likewise, it is hard to imagine a seriously successful transmission of an informed, active, and committed Catholic faith to the next generation without a strong network of Catholic schools. Nor should we ever underestimate the energy a vibrant parish school brings to the ongoing daily life of a parish. In any case, any serious U.S. effort at "New Evangelization" must confront the challenge of increasing religious non-affiliation among younger Americans - and the disquieting spread of that phenomenon among the largely young Latino Catholic population. Recently, Boston College (in collaboration with the Center for Applied Research in the Apostolate) has published a significant study on Hispanic Ministry in American Catholic parishes. One can read the summary report of its findings at http://www.bc.edu/content/dam/files/schools/stm/pdf/2014/BC-NatlStudyParishesHM-Rep1-201405.pdf. It is well worth reading in full! Of course, any study of parishes with Hispanic Ministry is ultimately a look at the present and future of the Church in the U.S. As the report itself acknowledges right away: "What we learn about parishes with Hispanic ministry today gives us a sense of what Catholic life in the United States already is in many places where Catholicism is growing vibrantly - of course, not without challenges. Considering current demographic trends and the steady growth and influence of Hispanic Catholicism, these communities also provide us with a glimpse of what U.S. Catholicism will be like in vast regions of the country - at least during the first half of the twenty-first century." Indeed, I think one of the most amazing things about post-conciliar Catholicism in the U.S. has been the inability or unwillingness in some quarters to recognize the full implications of this simple, yet so significant demographic fact! The second thing that is noteworthy, of course, about the study is that it is about parishes. As the documents itself declares: "Parishes matter. Parishes continue to be privileged places where most active Catholics learn, live, and celebrate their faith." That too should be obvious! For the most part, that has been the story of the Catholic Church in the U.S. for most of its history. It remains the case now and likely will be for the foreseeable future. There ought to be no more important project for those concerned with the evangelization of American society than the strengthening and supporting of American Catholic parish life. Where this basic parochial reality and the current Hispanic American reality intersect so significantly is in the widespread experience that, for the most part at least, the greatest vitality in American Catholic life is to be found in parishes with Hispanic ministry. Thus, for example, the study notes that weekend Mass attendance in parishes with Hispanic ministry "is about 22 percent higher than the average for all parishes nationally," with a median weekend Mass attendance in such parishes of 1110 compared to 750 for attendance in parishes overall. In my experience, of particular importance in contributing to the vitality of Catholic life in such parishes is the presence and role of apostolic movements and of Hispanic permanent deacons, both of which receive appropriate attention in this report. The study also notes that almost 40% of adult American Catholics self-identify as Hispanic, and that 93% of under-18 Hispanics are American born. Hence the consequential conclusion: "Much of the Catholic experience in the country during the next few decades will be significantly shaped by how the Church reaches out to this last group and whether young Hispanic in this age bracket, at least those growing up in Catholic households, decide to self-identify as Catholic." In my limited experience, it sees to me that much pastoral effort has gone into meeting the many immediate needs of immigrant populations and that the Church has responded creditably, even if not quite sufficiently, to the task of serving many of the Spanish-speaking adults in our midst. My guess is that there is much more to be done, however, to meet the distinctive pastoral needs of younger, American-born, English-speaking Hispanic populations, who experience some of the same challenges to faith that their non-Hispanic peers are also experiencing. Given the youthfulness of the Hispanic Catholic community in the United States, the study highlights "a disquieting gap between parishes with large Hispanic populations and Catholic schools." Catholic schools may not provide all the answers to the Church's many and varied challenges, but it is hard to imagine a seriously successful transmission of an informed, active, and committed Catholic faith to the next generation without a strong network of Catholic schools. Nor, I think, should we ever underestimate the energy a vibrant parish school brings to the ongoing daily life of a parish. In conclusion, the study identifies 12 areas requiring immediate attention. Two which I have already highlighted are a need for pastoral outreach to American-born Hispanic youth and the widening distance between Hispanic parishes and Catholic schools. Regarding the former, the study concludes: "Lack of appropriate investment in ministry with this population at a time when most young Catholics in the country are Hispanic is self-defeating." Regarding the latter, the study warns such a gap "may undermine the development of a 'Catholic school culture' among Hispanic Catholics." Among the other areas identified as calling for immediate attention, I would highlight two obvious and very problematic ones. The first is the demographic fact that in the near future "thousands of culturally competent pastoral leaders" will be reaching retirement age. I don't see any way around this (to me) most obvious point that dioceses and religious communities that are serious about the future of the Church in the United States must ensure that present and future cohorts of new priests, deacons, and lay ecclesial ministers are adequately prepared to meet this challenge. The second is the problematic financial sustainability of so many Hispanic parish communities. We should never make money the most important consideration in pastoral planning. But neither can we ignore the consequences of a lack of it! In his column in today's NY times, "The Streamlined Life," David Brooks looks at recent research comparing incoming college freshmen with those in previous generations. One of the first things Brooks notes is that American high school seems to be getting easier. That is not just a matter of serious grade inflation but problematic trends such as fewer hours spent doing homework we as a society we would do well to delve into this further. Certainly high school laxity and the overall decline in American literacy and education that seem connected with it ought to be a major concern - and not just for reasons of international economic competitiveness. But, back to Brooks' main concern, which is how the American college context has changed - not gotten easier in the sense high school has, but definitely worsened in that college admissions are more competitive in a context in which students are increasingly anxious about their eventual job prospects. Brooks recalls ho comparatively "benign" the 1950s and 1960s labor market was in comparison with today's increasingly anxiety-ridden environment. He notes the resulting change in college students' values: "In 1966, only 42 percent of freshmen said that being well-off financially was an essential or very important life goal. By 2005, 75 percent of students said being well-off financially was essential or very important. Affluence, once a middling value, is now tied as students' top life goal." As a member of that 60s generation myself , my take on that is that it reflects the extent to which my generation could largely assume an affluent future, and so felt more free to focus on other goals. Today's students don't seem to feel they have that kind of luxury. Changed circumstances change values. I recall, for example, how marrying one's equals was, in better times, an absolute priority among German and other continental royalty. But in the economically distressed aftermath of World War II, Princess Cecilie von Preussen (1917-1975), grand-daughter of Kaiser Wilhelm II, married an American from Amarlillo, TX, who told her father, the former Crown Prince, that while not a rich man he "could feed her." It is not surprising that in today's more stressful circumstances concern about one's economic future occupies a more central place in people's calculations than it did in the 1960s when the future seemed so much more secure. But what should be more worrisome, whenever and however that happens, is the collateral moral damage such a state of affairs can create. For example, "today's students score about 40 percent lower in measures of empathy than students did 30 years ago." Brooks concludes that today's youth seem to be "trying to armor up" for living in a world which we have made harder for them than it was for us. He writes "people clearly feel besieged. There is the perception that life is harder. Certainly their parents think it is harder. The result is that you get a group hardened for battle, more focused on the hard utilitarian things and less focused on spiritual or philosophic things; feeling emotionally vulnerable, but also filled with resume assertiveness." The latest issue of The Economist features an eagle perched on a globe and the headline question: What Would America Fight for? The question haunting its allies. Recent events in Ukraine and earlier the US's failure last Fall to use force against Syria after having in effect threatened to do so, have heightened doubts about America's international resolve and reliability. That American policies seem to be reflecting an increasing isolationism among American voters itself adds to the discomfort of this baby-boomer who was raised and came of age in an internationalist era, where American power in the world was not just a fact but also understood as a political and moral responsibility. Of course, there have always been isolationist tendencies in American society, although they seem stronger now than at any time in many decades. What is particularly troubling is how such sentiments seem to resonate with a growing loss of confidence not just in American power but in America itself, in what, for lack of better words, we commonly call the "American dream." Thus political strategist Doug Sosnik has located "the core of Americans' anger and alienation" in their "belief that the American dream is no longer attainable." This change in belief is rooted in a historically startling reality. "For the first time in our country's history," Sosnik writes, "there is more social mobility in Europe than in the United States." As the grandson of immigrants and as someone who grew up in the golden age of middle class progress that spanned the quarter-century after World War II, I find that an amazing revelation, a real challenge to wrap one's head around. Frank Bruni quoted Sosnik in his column in yesterday's New York Times, revealingly titled "America the Shrunken." It is not just that Americans increasingly fear their children will live in a less prosperous society with fewer opportunities than their parents, it is how our aspirations have correspondingly atrophied. As Bruni expresses it, the 2014 edition of the American dream seems to have become: "Squirrel away nuts for a leaner tomorrow. The worst is yet to come, so insure yourself against it if you're among the lucky few who can." It reminds me somewhat of a dystopian vision that seemed briefly to have some traction back in the 1970s of an America in which the rich retreat to their protected enclaves, while the rest of society decays - which is, in fact, not all that different from what is actually happening, except that the rich now are way, way richer than anyone in the 1970s might have anticipated. But it is not just the material impoverishment of our society that is so problematic for both American and the world. It is most critically the loss, in Bruni's words, of "the optimism that was always the lifeblood if this luminous experiment, the ambition that has been its foundation, the swagger that made us so envied and emulated and reviled." The British Empire likewise once embodied an optimism and ambition that made it also envied and emulated and, yes also, reviled. But when the sun set on the British empire in the wake of World War II, there was some comfort that its place as maintainer of order in the world was being taken by a very optimistic and ambitious post-war United States. Now, however, as America's sense of itself and of its responsibilities in the world seems to shrink, what is there to replace it? From Africa to the Middle East to Ukraine to the Pacific, we are witnessing the feeble structures of international order becoming even more enfeebled, with the result that everywhere chaos - military, political, economic, and moral - seems increasingly on the rise. It may well be that the 1980s myth of "morning in America" was a fraud that distracted us from facing up to the challenges of a changing world. But, as Bruni observes, "we're no better served by settling into the dusk." When something truly terrible happens, one response is to try to get away – away from the people, the places, the memories we might otherwise have cherished but which have now become painful. At the same time, we are often quite eager to talk about our troubles. So another response is to want to talk about it, to want others to know just how badly it hurts. That seems to be what the two disciples did in today’s gospel [ Luke 24:13-35]. They had followed Jesus all the way to Jerusalem, where the most terrible thing had happened. We all know what that’s like. We hope for something, work hard to get it. Then something goes wrong, and the path is blocked - by accident, or illness, or injustice. So it is no surprise that the two disciples decided to get out of Jerusalem as fast as they could – clearing out of town on Sunday, the day after the Sabbath. Maybe they had to get back to work! After all the excitement they had had and the enthusiasm they had felt as followers of Jesus, what a let-down it must have been to return to their regular, ordinary work! But, however eager they were to get away, Jesus’ memory was still very much with them, and they couldn’t help talking about him to the stranger who had suddenly joined them. And the stranger let them talk. He listened to their disappointment and disillusionment as they told of the dream that had lifted them up – only to let them down. But then the stranger didn’t just listen. He also had an answer. Of course, the disciples did not realize who the stranger was. Obviously they were not expecting to see Jesus. He was dead, after all. And dead with him were all their hopes for Israel’s future. In fact, Jesus would be the one to redeem Israel. But, before they could recognize him, they had to relearn what it meant to be the one to redeem Israel, to be the Messiah. And who better to teach them than this stranger? Then beginning with Moses and all the prophets, he interpreted to them what referred to him in all the Scriptures. We have a short version of what Jesus’ homily might have sounded like in Peter’s Pentecost sermon, part of which we just heard [Acts 2:14, 22-33]. What Jesus did on the road had quickly become the Church’s standard way of reading the Old Testament, understanding the Old Testament through the lens of the Risen Christ and learning to recognize Christ through the lens of the Old Testament. In re-interpreting the familiar scriptures, Jesus was refashioning an image that of course, they already had – because, rather than see things as they are, usually we see things as we are. The disciples had seen Jesus through their existing image of a messiah. Now they had lost both him and that image. Without quite comprehending it, they had reached one of those crises in life when everything seems to break down and a change is required. Without yet recognizing him, they were getting him back. And he was giving them a new image to hold onto and have hope in. And so they urged him to stay. They were beginning to get back their lost hope and didn’t want to lose it again in the night’s darkness. Once inside, the stranger revealed himself with a familiar gesture, which has since become the Church’s trademark. But this time they didn’t lose hope when he disappeared. He wasn’t gone. The darkness was. He had been with them on the road, a companion in their grief. He had been with them in his homily on the scriptures. And he was with them now for keeps in the breaking of bread. So now they couldn’t wait to get back to Jerusalem, that place of pain they had earlier been so eager to leave. And there they heard from the others, “The Lord has truly been raised and has appeared to Simon.” Simon Peter, their leader, would proclaim Christ’s resurrection for the rest of his life. And so would these two ordinary disciples, ordinary people like us. And how is the Risen Lord here today for ordinary people like us? The same way he was then with them – in the world we live in, in the people around us in whom we too fail to recognize Christ (and whom we may in fact fail to recognize at all). Our preoccupation with ourselves and our problems may hinder us from recognizing him. Still, he walks with us in our disappointments, hears and feels our frustrations, and keeps stride with us as we struggle to hope. He explains himself in the scriptures and stays with us in the breaking of bread, where we finally and fully recognize his Real Presence. And then he sends us, filled with the bread of his body, to announce to the world - in union with Peter and the rest of the Church - that our hope is not just a wish and is more than merely a memory, and that in spite of everything, The Lord has truly been raised – and lives with us still. Homily for the 3rd Sunday of Easter, Immaculate Conception Church, Knoxville, TN, May 4, 2014. The calendar may have turned another page to a new month today, but much of the media remains still stuck in what a distinguished student of saint-making Kenneth Woodward calls a "misleading metaphor." (See "The Making of a Misleading Metaphor: No 'big Tent' in Recognizing Popes as Saints" http://www.firstthings.com/web-exclusives/2014/04/the-making-of-a-misleading-metaphor). Woodward is the author of Making Saints: How the Catholic Church Determines Who Becomes a Saint, Who Doesn't, and Why (1990). On the whole I agree with Woodward's "misleading metaphor" analysis, although I wonder whether he too may inadvertently risk succumbing to that "misleading metaphor" when he refers to Pope Saint John Paul II's joint beatification of Pope Pius IX and Pope John XXIII in 2000 as "an extremely odd coupling of a liberal and a reactionary pope." Aside from the stereotyping of past popes in contemporary political categories, what is also ignored is the fact that Pope Saint John XXIII himself had hoped to be able to beatify Pope Pius IX at the close of the Second Vatican Council. That said, Woodward's more important point, which I think cannot be repeated too often, is that the focus on the Church as being divided between conservatives and liberals "is largely the fixation of Catholic partisans in North America and parts of Western Europe, where only a minority of the world's Catholics now live." As the first Pope from Latin America, Pope Francis represents, reflects, and articulates the concerns of a much larger Catholic population. I see that reflected, for example, in the Holy Father's stated concerns about increasing economic inequality - not just his famous recent tweet, but his more formal statements in Evangelii Gaudium and elsewhere. The joint canonization was certainly an important moment in the life of the contemporary Church, and it is, I think, legitimate to read it as a somewhat official interpretation of the charisms and contributions on Saints John XXIII and John Paul II - an interpretation which rightly recognizes both pope-saints as being basically on the same page on earth even as they are now in the same place in heaven. Meanwhile, I look forward to celebrating the new saints' feast days when they come around in October. Until then, enough said on the subject!